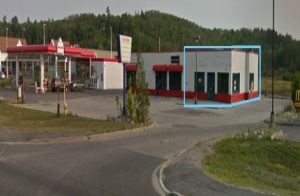 Shawn Abramovitz at Core Consultants Realty is marketing for lease an end cap unit with drive-thru at 721 Centre St. at Queensway in Espanola, community located about 70 kilometres west of Sudbury in Northern Ontario. A former Dairy Queen location, the 1664 square foot unit is adjacent to a Petro Canada gas bar and McDonalds and Tim Hortons, Canadian Tire and Your Independent Grocer are close by. Available immediately, the space is also across from the FreshCo and Hart-anchored Espanola Mall. A wide selection of uses are suggested, though hamburger use is not allowed. Copyright Developers & Chains 2019. All rights reserved.